With the transfer news coming thick and fast now that the summer window has opened early, there’s already been plenty to write about with regards to players on the move ahead of next season. Fabinho has been confirmed by Liverpool in a move from Monaco, and it seems only a matter of time before Arsenal get some serious business done for as many as three new players for £75million in the form of Sokratis Papastathopoulos, Bernd Leno and Caglar Soyuncu, according to the Sun. So what else do the Premier League big boys have in the works? Manchester United have shown they’re not afraid to spend big in recent times, bringing in Paul Pogba for a record-breaking £89m two years ago and continuing to recruit big names like Romelu Lukaku, Nemanja Matic and Alexis Sanchez. AS have reported that Manchester United are in for Gareth Bale after his superb showing in Real Madrid’s Champions League final win over Liverpool, though his club will ask for £130m. This would break two transfer records – as the £89m club-record fee BBC Sport claim they paid for Pogba in 2016 is also the all-time Premier League record fee paid for a player. 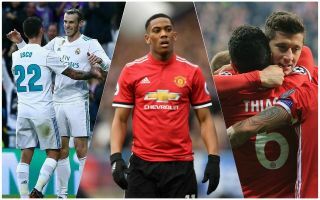 Big-name attacking players like Bale look precisely what’s needed to close the gap on Manchester City next season and one can imagine United should have the money to get this done. "I need to be playing week-in-week-out…that hasn't happened this season." Speaking of the Champions League final, it’s become ever clearer after that defeat against Real Madrid that Liverpool urgently need a new goalkeeper. According to the Times, they’ve got a decent one in mind as they target £80m-rated Roma shot-stopper Alisson this summer. Were the Reds to pull this off, that would beat the club-record £75m BBC Sport report they paid Southampton to sign defender Virgil van Dijk back in January. With money to burn, or so it seems, £80m on Alisson seems well worth the investment to bring in a genuine top class ‘keeper after being let down so many times by Loris Karius and Simon Mignolet. This is another that could break two transfer records as it would be the highest fee in sterling paid for a goalkeeper, according to BBC Sport‘s report that £36m Ederson currently holds that record.